Social Commerce (a.k.a. Social Buying, Group Buying, or Social Sales) exploded in 2010 with sites like Groupon and LivingSocial dominating this fascinating new trend. The odds are you have heard of these sites via word of mouth, email, or even more likely, because your friends posted one of their deals on their Facebook or Twitter Accounts. The basic concept is that a consumer can get a great deal on something if enough people agree to also buy the product at the discounted price. This is called the tipping point. These types of promotions are usually time based and they provide incentive for consumers to tell their friends about your same deal. Making it easy for consumers to share the deal on Social Media sites is one of the key ingredients in Social Buying Promotions. Should a deal not tip, merchants have the option to cancel, edit, or force tip the relevant orders. 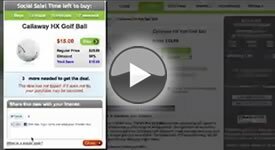 <img id="nextSocialThumb" alt="Callaway HX Hot Golf Ball"
IF_UNTIPPED(<span>SUBTRACT(THRESHOLD,QUANTITY_COUNT)</span> more needed to get the deal. Be sure the replace any red values with actual values that you set up in your promotion. Once you send out the promotion to your customer base orders will start to flow in. If your tipping point is not met, you have the option to force tip orders in using the batch processing feature. Good luck running your first Social Sale and do not forget that you can contact your Account Manager directly should you have any questions.